Bows bows bows, everywhere you look. I love it! I've not worn a ribbon in my hair since I was knee-high to a grasshopper and I don't think I could get away with wearing one now. 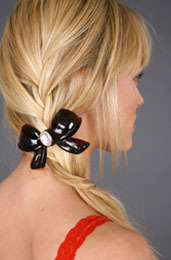 So this Plastic Bow Barrette from Urban Outfitters is a nice grown up alternative (yeah right). Now you can wear a bow in your hair without looking like a sap or an overgrown schoolgirl. Best part is it's on sale for a paltry $6.99, bad news - only in the US [insert full on girly tantrum here]. In a bid to highlight waste caused by the use of free plastic shopping bags, Triumph International Japan has showcased new lingerie that can be converted into a shopping bag. Packaging use in the home improvement market is to come under scrutiny from the Waste and Resources Action Programme (WRAP) as it seeks to add to its progress in the grocery sector. WRAP staged a dinner for some of the home improvements sector’s biggest players last month to kick off its programme of work in the area, which will include looking at how packaging can limit damage to products. Mark Barthel, WRAP’s special advisor on retail and innovation, said the DIY and home improvement sector was “second only to grocery in terms of the impact it has on lifestyle behaviour”. Later in the year WRAP will also turn its attention to the packaging employed by major internet retailers, including Amazon, and the grocery retailers’ web sales channels. WRAP’s main focus so far has been on the grocery sector, where it has signed up 13 retailers and three brand owners to the Courtauld Commitment, the landmark agreement implemented to reduce packaging and food waste. WRAP is also seeking applications for its £8m Waste Minimisation Innovation Fund in two new streams. One will provide funding for schemes that can reduce household packaging waste. The deadline for applications is 31 January. For more information, visit www.wrap.org.uk. Plastic: What's in it, and is it safe? Plastic is raising concerns among researchers that in some forms it may be toxic and dangerous - not only to the environment but also to human health. While it's everywhere in modern society, there are options for those who want to minimize the use of plastic. While plastics haven't been definitively linked with health problems, studies show the prevalence in our bodies of chemicals used in plastic and the correlation between these chemicals and health issues. One study, released in June by Environmental Defence, a national advocacy group, tested a sample of Canadian children and parents for the preponderance of 68 chemicals, all found in consumer products. The findings showed that on average the participants' bodies contained levels of 70 per cent of these contaminants. What's worse is that children had higher levels than their parents. According to Kathleen Cooper, senior researcher at the Toronto-based Environmental Law Association, plastic itself is not the problem. It's some of the material used to make plastic that is harmful. "Manufacturers all over the world use chemicals that soften, stabilize and create malleable plastic products. These chemicals contain phthalates and other dioxins that are known endocrine disruptors," Cooper said. Add in toxic metals, such as lead, which is used for colour, stabilization and as a flame-retardant. "The use of these chemicals is totally unregulated internationally," Cooper said. "So even if there is a voluntary agreement in domestic markets, the cheap stuff from developing countries or export processing zones makes it on to our shelves and into our homes." Among the more worrying materials for contaminate leaching is PVC (polyvinyl chloride), commonly referred to as vinyl. The chemicals leached during the PVC lifecycle include mercury, dioxins and phthalates. PVC is used in numerous consumer products, including adhesives, detergents, lubricating oils, solvents, automotive plastics, plastic clothing, personal-care products (such as soap, shampoo, deodorants, fragrances, hair spray, nail polish), as well as toys and building materials. Organizations including the U.S.-based National Toxicology Program, the Environmental Protection Agency, the International Agency for Research on Cancer and the National Institute of Occupational Safety and Health agree that vinyl is one of only 52 chemicals/compounds designated as a confirmed human carcinogen. As a result, many groups, including Greenpeace, Children's Health and Environmental Coalition (CHEC) and the US-based Center for Health, Environment and Justice (CHEJ) advocate a restriction or prohibition of PVC in all consumer products including toys, building materials and packaging. Even though numerous studies, including a 2003 Center for Disease Control research report that documented human exposure to 116 chemicals, show heightened levels of toxins in people linked to PVC exposure, governmental and industry regulation in North America is minimal at best. In the past decade there has been only one voluntary withdrawal issued in North America for toys containing one specific phthalate. In contrast is the European Union's responSE: Seven years ago the EU banned six separate phthalates in children's toys, and it continues to review and amend its list. "Ultimately, governments have a responsibility to regulate things that impact people's health," says Brian McCarry, department head of chemistry at McMaster University and an expert on environmental contaminants. "The European Union is by far ahead in this capacity; they are more prepared to step in and use precautionary principles." In the absence of government controls, many advocacy groups are calling on consumers to get involved. Particularly, Cooper said, since the current method of regulation allows trade to trump health. "People need to get upset about this. It has to be consumers voting with their wallets; consumers expressing concern," Cooper said. By demanding alternatives - through letter-writing campaigns and purchasing power - consumers are creating a market for less toxic, more sustainable products. While the number of products made of toxic PVC can seem overwhelming, there are alternatives as the number of viable, natural and non-chlorinated plastic substitutes in the market grows. At present, labelling laws do not require manufacturers to list all toxins used in the creation of their product. However, there are easy ways to recognize a PVC-based toy or produCT: Look for the three-arrow "recycling" symbol with the number 3 or the initials PVC, which indicates polyvinyl chloride. If neither symbol is present, then call the manufacturer's question/comment line (usually a toll-free 800 number) listed on the package or label. Another clue to look for is the use of malleable or soft plastic. This can be found in toys, but also on clothing, bed linens and packaging. Read the labels and when in doubt, opt for a different product. For those concerned about what's in toys but unable to do extensive research on what they contain due to the holiday-buying rush, pick toy manufacturers who opt for non-PVC-based plastic. These brands incluDE: Chicco, Evenflo, Gerber, International Playthings (including Primetime and Early Start), Lego, Sassy, Thomas and Tiny Love. According to Greenpeace's Toy Report Card, Discovery Toys and Manhattan Baby also provide an extensive selection of PVC-free toys, but some products do still contain it. Another alternative is to purchase toys made from organic cotton or certified sustainable wood. Companies that specialize in these fibres incluDE: Brio, Lamaze, Melissa & Doug, Thomas and Woodkits, to name a few. Look for other plastics that are considered less harmful, such as #1 PETE, #2 HDPE, #4 LDPE and #5 PP. While these plastics also leach chemicals, studies suggest that their level of toxicity is not as great as with PVC products. a.. Choose refillable containers. Glass, for example, can be re-used for food storage. c.. Buy in bulk, whenever possible. It's the least-packaged option. d.. For wrapped foods, choose butcher paper, waxed paper or cellulose bags. e.. Bring cloth bags when you go shopping, rather than using PVC-based plastic bags. f.. Choose things made from #1 (PETE) or #2 (HDPE) whenever plastic cannot be avoided. These are the most commonly recycled plastics. g.. Avoid plastics that aren't readily recyclabLE: #3 (PVC), #4 (LDPE), #5 (PP), #6 (PS), #7 (often polycarbonate). h.. Avoid single-use, disposable packaging. a.. Bring your own non-plastic container to salad bars, yogurt shops, etc. - any place you'd otherwise be served food in plastic containers. b.. Avoid plastic cutlery and dinnerware. Use stainless steel utensils and look for recycled paper products. c.. Microwave foods and drinks in oven-proof glass or ceramic dishes with lids. Never let plastic wrap touch food while in the microwave, as this is one way chemicals are suspected of leaching from plastic into food. d.. When purchasing cling-wrapped foods from the supermarket or deli, slice off a thin layer where the food came into contact with the plastic and store the rest in a glass or ceramic container, or in non-PVC cling wrap.